A travelling John Muir library exhibit is making its way across Wisconsin! Through 2016 the Wisconsin Historical Society is providing a f ree exhibit to public libraries in 25 communities. The exhibit explores Muir’s youth, advocacy for national parks, and his views on environmental issues such as logging, hunting and climate change. The exhibit includes eight panels and each library receives enough free copies of Muir’s memoir The Story of my Boyhood and Youth to host a book club. Libraries are also receiving an anthology created by the Historical Society called Wisconsin’s Environmental Tradition: A Reader to put Muir’s memoir into context. Society staff are also giving presentations about Muir and leading book discussions at each location. Dates and locations of the exhibits are listed below. 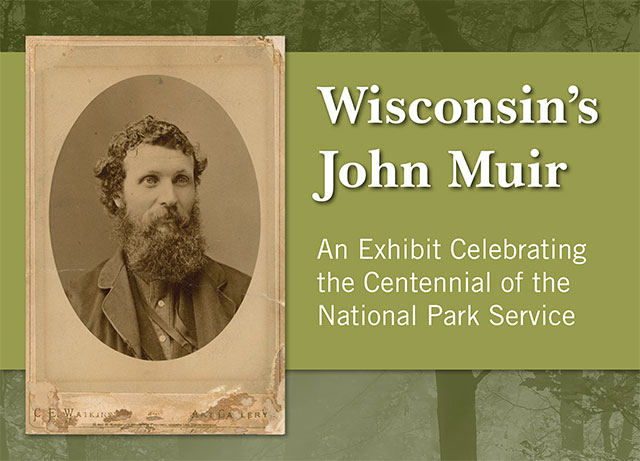 More information on the exhibit can be found on the Wisconsin Historical Society’s website.